Dean Wreen is not having a good week. Her college is in dire financial straits and a plan to close its tiny, all-but-forgotten natural history museum is sending unexpected shock waves across campus and out into the local community. At home, her ailing ex, Greer, is staying with her—sending shock waves of a different sort through her relationship with her current (and much younger) girlfriend, Andromeda. Town-gown relations are in tatters, the local newspaper is erupting in protest – and even the awful, historically inaccurate dioramas in the museum have started mouthing off -- literally! 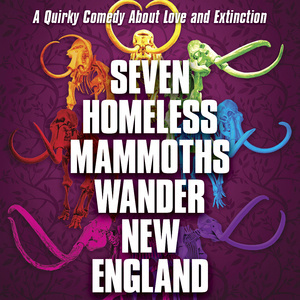 Seven Homeless Mammoths Wander New England is a delightful screwball comedy about the perils of monogamy, certainty, and extinction.